The extreme forward tilt of the cylinder bank (55Â¯) ensures a low center of gravity. In this way it was possible to achieve an ideal wheel load distribution of 50:50 percent in combination with the overall geometric layout. The engine has an extraordinarily narrow design achieved by a series of special design features. The engine width at the crankshaft level is approximately the same as for 600-cc engines. This not only allows for very deep engine installation and maximum lean angle, it also gives the bike a narrow and sporty silhouette. The engine can rev up into the five-digit regions and output exceeds 160 hp (more than 117 kW). Environmental compatibility is safeguarded by a closed-loop three-way catalytic converter and digital engine electronics, which have been standard features on all BMW motorcycles for years. The engine of the K 1200 S is based on the latest generation as presented at the beginning of the year in the R 1200 GS. It also features integrated knock control and in this advanced four-cylinder engine, it represents the most sophisticated engine management system currently available for motorcycles. The K 1200 S is also highly innovative on the suspension side. A revolutionary front wheel suspension using two parallel links--without telescopic forks--ensures extremely sensitive response together with excellent precision, outstanding overall rigidity and low weight. The electronically adjustable suspension also represents a world first in production motorcycle manufacturing. The new K 1200 S is of course also equipped with the unique BMW Motorrad Integral ABS in the partially integral version. In conjunction with the EVO brakes, this system ensures maximum deceleration and the shortest of braking distances in all road conditions. 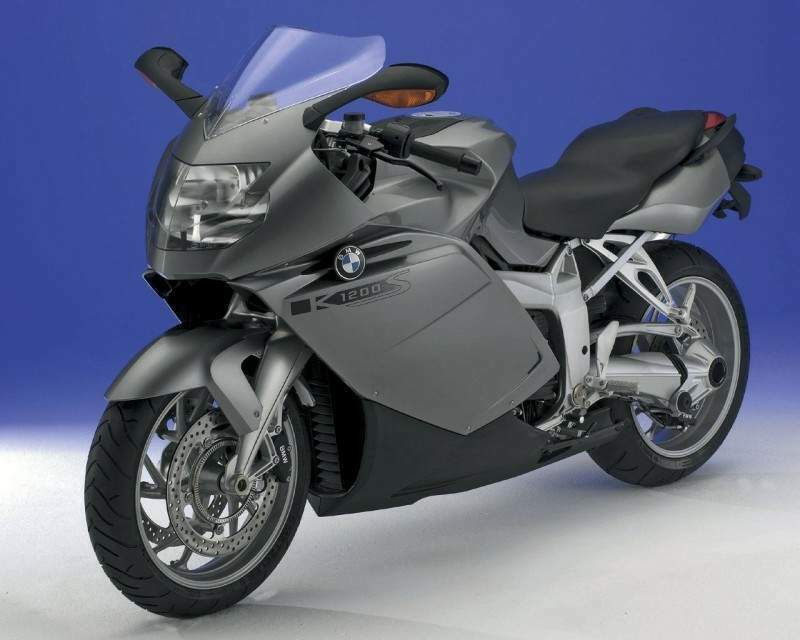 The new BMW K 1200 S will be presented to the international public in September of this year at the INTERMOT motorshow in Munich. It will be launched onto the market soon after. The price has not yet been set. All familiar models of the K family, the K 1200 RS, the K 1200 GT and the K 1200 LT will remain part of the model range beyond 2004. Traditional, dyed-in-the-lederhosen BMW boxer afficionados still haven't gotten over the blasphemous use of an in-line four-cylinder engine in the first K bikes back in 1983. 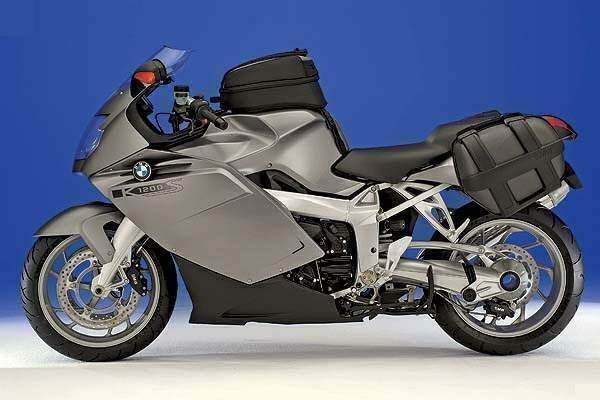 Now they have even more to fret about--while the rest of us can revel in this most-powerful BMW motorcycle in history. Blessed with the highest horsepower of any stock production BMW motorcycle ever, the K1200S offers a unique blend of sportbike character along with traditional BMW features such as heated grips, ABS and shaft drive. 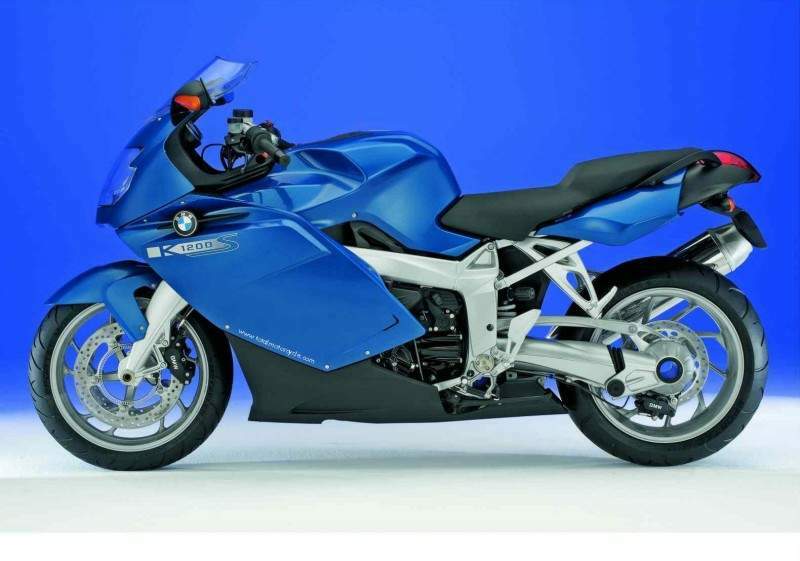 Another tradition buster for BMW is to position the four cylinders and crankshaft transversely, turned 90 degrees from other K bikes—but the way other in-line sportbikes do it. Unlike conventional sportbike practice, however, the cylinder bank is canted forward at a steep 55-degree angle. This helps lower the center of gravity, but at the same time lengthens the bike, as can be noted in the 61.9-inch wheelbase spec. Advertisement Rider’s first Ridden & Rated article on this bike was in the November 2004 issue following its initial press introduction. We’ve now covered some miles on one here on home turf and put the K1200S to the test on Barnett Performance’s Dynojet dynamometer. Peak rear-wheel horsepower of 146.4 arrived at 10,200 rpm, while maximum torque of 85.7 lb-ft occurs at 8,350 rpm. Although power and torque peaks are quite high, that’s not the whole story. Approximately 70 percent of peak torque is available from 3,300 rpm on up. 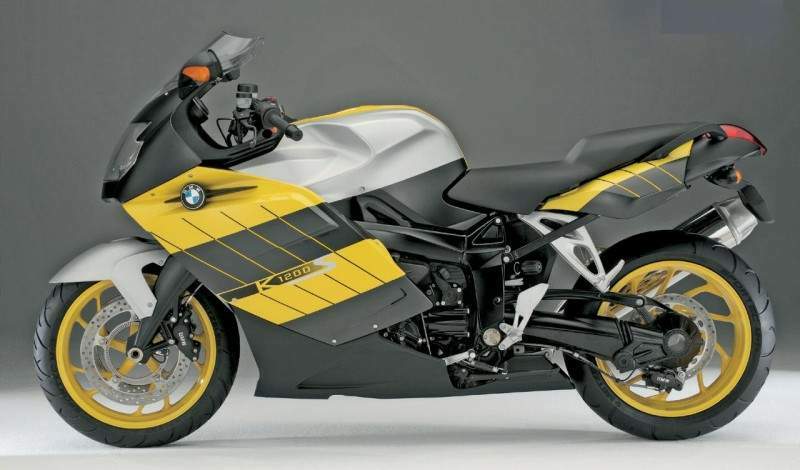 BMW has transferred some technology from its high-performance cars and its Formula One racing program to the K1200S. To avoid damaging detonation with the near-diesel 13:1 compression ratio, sensitive dual knock sensors retard spark timing if pinging is detected. Oil is also sprayed onto the bottom of the pistons to cool them. Valve activation with the four-valves-per-cylinder layout is via an unusual low-mass “follower arm” setup that permits the relatively high 11,000-rpm redline. Rather than provide a fixed service recommendation based on mileage, BMW uses the computer to determine when it’s time for a valve adjustment. That requires a technician to connect a tester to the bike’s diagnostic connector. This, along with required special shims and tools, makes do-it-yourself valve adjustments rather difficult and costly. Twin balance shafts positioned below the crankshaft running at twice crank speed help cancel second-order vibrations, but we noticed that there’s still a moderate amount of buzziness that comes through the handgrips between about 5,000 and 6,000 rpm. According to our contact at a local dealership, Throttlemeister’s part number FH & AB14-H bar-end weights help eliminate these vibes (www.throttlemeister.com). Cold starts don’t require any special procedure, as the computer adjusts mixture and idle speed. Starting is immediate and rideability is very good even when cold, and throttle response is smooth. Idling along in first gear in traffic the engine can get a little jerky, but above that it just keeps getting better all the way to redline. Out on the road, this means you can lug it down to 30 mph in sixth gear, then pull away smoothly without downshifting. Grab a full handful of throttle and a deep snarl emanates from the dual air intakes as the engine quickly transforms into a savage beast. Acceleration is stunning as the bike unloads the front wheel and heads for the horizon with you hanging on, grinning ear-to-ear. Originally, the first K1200S test bikes had very glitchy throttle response, which has mostly been corrected. The only gripe we had was that when the throttle is closed above 3,000 rpm the injectors shut off (which is common on fuel-injected bikes) but then the power comes back abruptly just as you’re rolling to a stop. However, there is reportedly a new computer reflash available through dealers that smoothes and softens the transition, and current production versions should have the update. BMW has employed a stacked six-speed cartridge transmission design to shorten the drivetrain, along with a wet clutch—again more departures from tradition. Shifting is quick and reliable—in fact it may be the best-shifting BMW to date, though it does make a bit more noise than we’d like at low speeds. Clutch pull with the hydraulically actuated lever is moderate and modulation is smooth. A number of high-tech features are found on this new flagship model. CAN bus multiplex wiring drastically reduces the number of wires that it takes to connect everything, with only six wires going to the instrument cluster, for example. There are no fuses; if the computer detects a problem with a particular component, it will deactivate it only, instead of shutting down everything on a circuit as fuses do. Then, each time the engine is restarted, the system rechecks all circuits and will reactivate an item if a problem is no longer detected. The bike comes equipped with an electronic immobilizer that uses an integrated transponder chip in the ignition key. An alarm with a motion sensor is optional. There are also nifty light-out warnings, a clock, gear indicator, etc. not typically found on other sportbikes. With a five-gallon tank and mileage in the mid-30s, fuel range was a bit of a nuisance. Generally, the low-fuel light comes on around 110 to 125 miles, depending on how hard you’re riding it. Our bike’s fuel economy varied from a low of 32.1 to a high of 41.4 mpg, with an average of 36.1 mpg. For a sportbike, riding position and seating comfort for both rider and passenger are moderate. No seat-height adjustments are offered, but a lower seat is available. The footpegs are a tad high, needed for sufficient cornering clearance, the handgrips a bit forward and low for long rides, yet reasonable for a few hours. We love the optional heated grips; get them if you ride in cold weather. Windscreen coverage is better than most sportbikes, but does direct the airblast at the bottom of the helmet, which creates lots of wind noise. Therefore this is the first item we would change. The foldable rear-view mirrors provide a good view aft, are steady and also house the turn signals. Both the speedometer and tach have easy-to-read analog dials, there are two trip odos; one switches to remaining range once the low-fuel indicator comes on. Digital bar-graph-type fuel-gauge and coolant-temp indicators are also included. A new option that was first introduced on this model, Electronic Suspension Adjustment (ESA), is a hydraulic servo-operated suspension-adjusting system that allows the rider to select one of three front and rear rebound settings (comfort, normal, sport) on the move with a push of the handlebar-mounted button. In addition, rear spring preload can be changed (three settings, solo, solo with luggage or two-up) while stopped, using the same button. Increasing preload using the ESA raises the seat height slightly, but also increases cornering clearance. If you don’t select this option, you’ll still get a convenient remote preload adjuster as seen on other BMWs, along with a reasonable damping adjustment range, but we really enjoyed having the ESA and recommend it if you’ve got the extra loot. Handling is neutral and predictable, with plenty of available lean angle, and on-rails, confidence-inspiring smoothness. However, the steering damper added since the first intro makes the bike feel stiff at lower speeds, almost like it has over-tight steering-head bearings—but it also makes it very stable at speed. In the really tight stuff, it takes some effort to flick the long 560-pound bike from side to side, but it makes up for it on high-speed sweepers and highway runs with its calm demeanor. Our bike had the optional partial Integral ABS, which means the front brake lever is also linked to the rear caliper, but the rear lever only controls the rear brake. BMW is still using the power-boosted braking system, which doesn’t provide assist when the bike is shut off. However, the pump seems to be a lot quieter and lever feel is much less abrupt than earlier versions. Now, the first light application doesn’t grab, but power quickly ramps up allowing stops so hard you better hang on tightly! Rear braking is intentionally moderate. When we first got the bike, the front brake groaned, squealed and chattered. However, this slowly went away. Apparently the linings were glazed or contaminated. Bridgestone BT014 or Metzeler Sportec M-1 radial tires are standard fitment. Our test bike had the Metzelers, which grip well, track nicely and don’t chase pavement grooves. However, after only 2,000 miles the rear tread was starting to look a bit thin, and our local dealer had a K1200S with 2,500 miles that had cords showing. We borrowed a set of the optional factory saddlebags and had the brackets installed, which takes less than 15 minutes. The bags only come in one color and are quite small by BMW standards, but have a unique expanding feature, which allows you to overstuff them yet still use the locks. There’s also a removable water-resistant cloth liner that comes with each bag. We were able to easily fit an XL full-face helmet in with the bag expanded, having room to spare. Expect to pay about $800 per pair (we didn’t include this in the price as equipped). It’s not cheap, but the K1200S is a handsome, modern high-tech road burner that we expect will be popular with well-heeled riders who are current BMW owners, and it should grab some folks away from bikes such as the Suzuki Hayabusa, Yamaha FJR1300 and Honda CBR1100XX. It offers more creature comforts than other sportbikes, along with more performance and sporty handling prowess than previous BMW models.